Protecting Your Future Is Our Business! 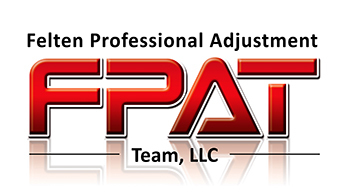 Felten Professional Adjustment Team, LLC. specializes in quality property risk management inspections servicing the entire state of Florida. Our services include: Insurance Replacement Cost Appraisals, Reserve Studies, Windstorm Mitigation Inspections and Roof Condition Assessments. We utilize a staff of highly qualified inspectors made up of Building Contractors, Insurance Adjusters, Professional Reserve Analysts and other insurance and construction professionals. As a company we maintain an extremely high level of insurance and construction industry experience and knowledge. This thorough understanding has resulted in the most comprehensive and accurate reports in the industry. We take great pride in providing the highest quality customer service. Our day is never too busy to take your phone call or meet with you to address any questions or concerns you may have. Our clients and future clients will always be our highest priority. Please explore our site to learn more information about all of our valuable services. All proposals are provided at no charge and can be requested by completing one of our simple online forms, just click on the "Proposals" tab. In most cases a formal proposal will be supplied within 24 hours.